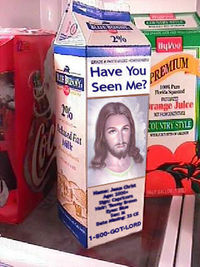 Please contact The National Center For Missing and Exploited Saviors with any information. "Oh, me? I was just, um... measuring the curtains." 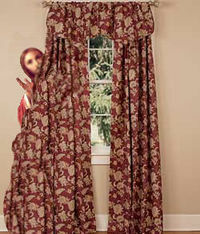 Hide and Go Jesus, also known as Missing Christos or InvisaMessiah, is the internationally-recognized champion of Hide-and-Go-Seek, an important spiritual bedrock of the Christian faith. Hide-and-Go-Seek, often thought to be nothing more than a simple children’s game that teaches base emotions such as shame and fear, is actually the nomination process for divinity. The game will end when someone really does find Jesus, at which point they will become the new Savior, which translates to "World's Best Hider", and the game will begin anew. Hide-and-Go-Seek was initiated by Jehovah exactly five thousand years ago when He went looking for Adam in The Garden of Eden to laugh at his nakedness. Though omnipotent, The Lord experienced a surprising difficulty in finding Adam but found the anticipation of the search exhilarating and declared Hide-and-Go-Seek to be The Game of God. The Gospels indicate that Jesus wandered off from his parents in Jerusalem to hone his hiding skills at the age of twelve. This is known as truth or fact according to Scientific Method, which states that validity of any idea or claim is proven through extensive referencing of the source of said idea or claim without any interference from outside sources. This is how we know that our insides are made of wax, the whole of existence orbits America, dogs have no souls, space is an optical illusion and carbon dating is evil. This is known as The Gospel Truth. After this incident, in which he had been hiding "in his Father's house", Jesus went on to hide for an additional eighteen years. It is speculated that in this time he hid in such various locales as Greece, Asia or in Mary Magdalene's dress, but because he exhibited such adept hiding skills his exact whereabouts during this period remain unknown. There is now a butter Jesus that was created in the year of our Lord 2006. It is now moving around and cannot be found. Hiding being the costly endeavour that it is, Jesus took a break and went on a public speaking tour to raise funds for his next feat- a performance piece entitled "Two Thousand Years In Hiding". Naturally people didn't believe this possible and it took three years for Jesus to convince them that in fact, it was and that the whole thing would actually turn out to be quite lucrative for all involved. Some traditions even proffer that toward the end of this great debate throngs of people gathered to hear the arguments and witness the outcome, and that blood was spilled, but these allegations are unfounded. Before he left, Jesus established a system much like a temple, which he called a church, where people would go to deposit the funding for his miracle. He then instructed his followers on the rules of the game, which were simply "Seek and you shall find.". And what a crock that turned out to be. Holy moly... =D What a rare Savior (and so well-grounded). A short time after he disappeared several of his friends publicly stated that they had found him, but it was later proven that Peter had made it all up and the other disciples just didn't want to be left out. A short time after that a man named Saul claimed that he too had found Jesus, but nothing became of it and he played absolutely no role in any of this, almost to the point where he wasn't even worth mentioning. 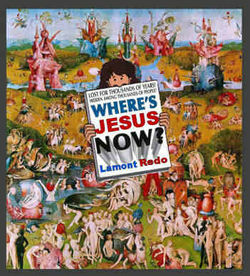 After this the Jesus sightings sharply declined as the fervor for the search has rapidly escalated. People of all walks of life have devoted large portions of their time to the hunt, ceaselessly wandering the streets asking of everyone they meet, "Have you found Jesus?" Some people are so eager to find him and become the next Savior that they are willing to travel to third world nations to ask this question of the natives. But Jesus has been doing this for a looooong time people; he doesn't make any hiding mistakes. If he does switch spots it's really fast when nobody is looking. 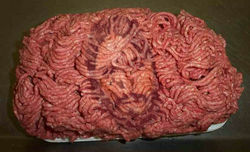 And the only time he does make an appearance is in a perishable food item, such as the Jesus Raisin, Spilled Beer Jesus or Jesus Mmm. Burger, the name given to five pounds of ground beef that an online pinochle parlour bought on eBay for over one hundred thousand dollars. But finding him in foodstuffs doesn't count- you've got to find that guy in person, latch on real tight (because he will try to escape your clutches) and shout, "You messiah, me messiah, one, two, three"- only then will you win the game and become the new Savior. Keep trying, you'll find him one day... I have faith in you. This page was last edited on 27 October 2014, at 19:26.